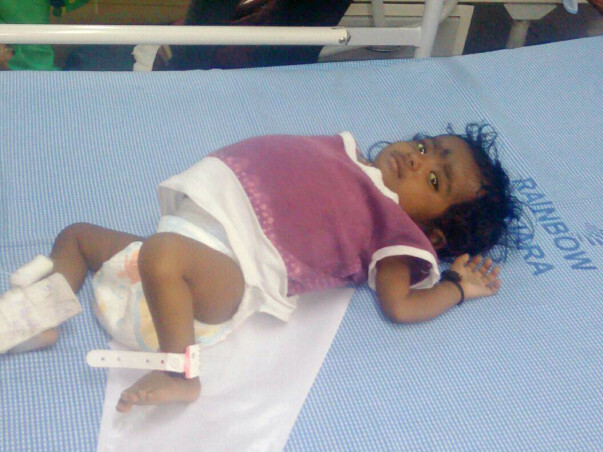 Rithvika is only 10-months-old but her short life has been very painful so far. She doesn't know why, but her stomach hurts and burns all the time. 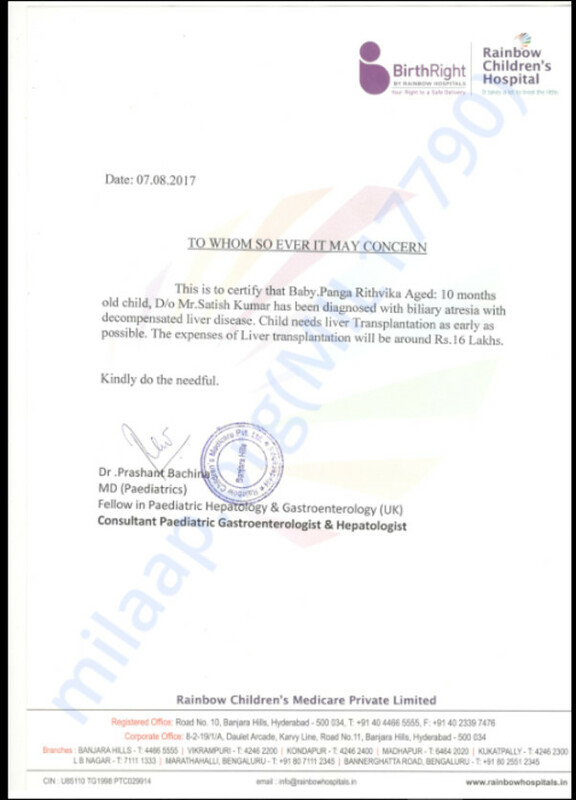 Her liver is completely damaged and she needs an urgent liver transplant to find some relief from her pain. “Every night she cries herself to sleep and I cry along with her. When your small baby is in so much pain, what else can you do? Some nights - no one at home gets any sleep. 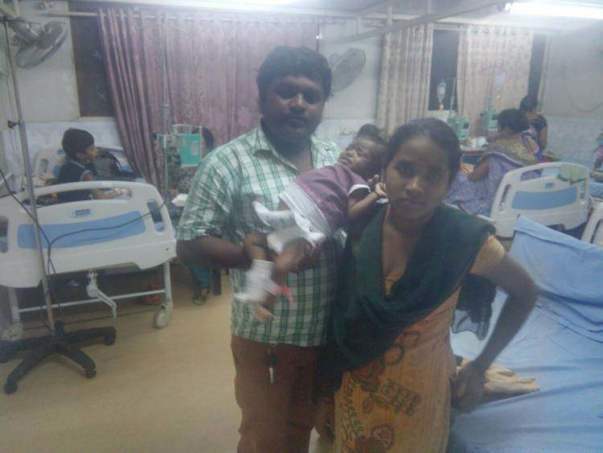 It is very hard for us to see our daughter bear so much suffering,” says Lalitha, Rithvika's mother. 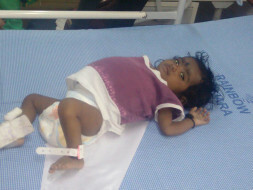 Rithvika's stomach is hard and swollen because of the damage caused to her liver. Any pressure on the stomach hurts her, so her parents make sure the carry her from the side so she feels as less pain as possible when going from one place to another. Satish works as a driver in Hyderabad and earns Rs 9,000 per month. He is the only earning member of the family taking care of not only his wife and child, but also his aged parents and younger brother. To save his first and only child, he has borrowed heavily from local moneylenders. 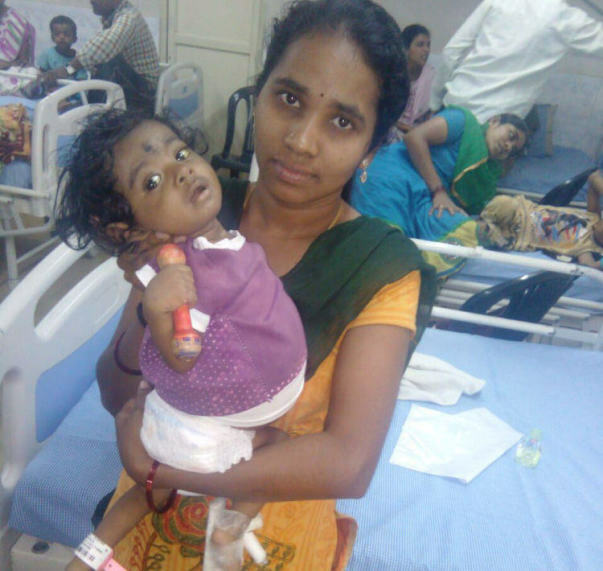 Rithvika's treatment began when she was just 3-months-old. She was passing white stool and her parents decided to get this checked. “The doctor asked us to do a MRI scan and told her her gall bladder was malfunctioning. She needed an immediate operation,” Satish says. Shortly after the operation, she slowly fell sick – unable to eat. The bile from her liver was not getting stored in the bladder. It was eating away at her liver. In just two months, her liver was completely damaged and she had to take medications to live. A liver transplant will cost Rs 16 lakhs. It is an amount that Satish with his modest salary cannot afford. He has already spent all his savings and paid medical bills of over Rs 5 lakhs so far. But it will all be for nothing if his daughter does not get the liver transplant that will save her life. Help these parents save their only child and give her treatment that will end her pain. Contribute now. Here is an update on Rithvika. Rithvika is at home and is doing good. She has to visit the hospital for checkups and for dressing the wound once a week. She is on medication for three months. She is improving slowly. She is eating, playing and is involved in all activities cheerfully. Thank you for your support and love for Rithvika. Thank you for the love and support you have shown my daughter Rithvika. She is doing better now. She was discharged 2 days back. She has a small infection on the skin and the doctors have suggested dressing over the wound daily. Thank you all once again. Please do pray for her complete recovery. Here's an update on Rithvika. The operation is done last month but due to some post operative complications, the hospital has conducted another surgery to clear the infections. The baby is doing fine now and the hospital is looking forward to discharge her soon. May God bless the child, cure her disease and make her healthy.